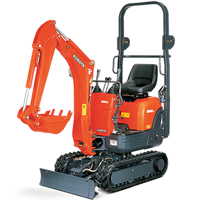 The Kubota K008-4 micro excavator is ideal for narrow access and is designed to go through gates and doorways as narrow as 700mm wide. So throw away that spade and remember life is for living, not spending all your time digging. 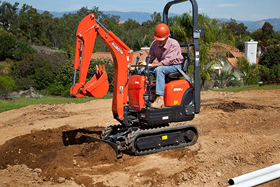 This Kubota micro excavator is easy to manoeuvre and operate, these micro excavators are used for small to medium sized jobs such as digging out driveways, digging drainage and cable trenches.